This is a collaborative review/discussion on the anime D-Frag between Ascendant - Izanagi and Kristof. Please be aware that while you're reading this, you may get bagged. 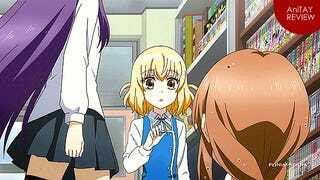 Ascendant: Okay, so today we're gonna talk about D-Frag, an anime released….. uh, when was it again? Kristof: Winter 2014?...Let us pause to check when it was released. Ascendant: Ah yes, I remember watching the first episode, and then I saved it up for bingeing. I don't like waiting. Kristof: I was not watching anime at the time; I only got back in the habit less than a year ago, and while scrolling through FUNi's list of shows, I saw the card and was like….ohh pretty picture. I then proceeded to binge watch the show over a couple of days. Ascendant: It was a pretty cool little show, lots of funny gags. In any case, we're here to talk about the show, not our habits dammit. Kristof: So, I would give the show a 5/10 for story, as that was not really the point of the show. Ascendant: Really?! That's quite a low score. Someone's in for a bagging. I would personally give it an 'okay-ish' 7/10, because there was a whole harem sort of vibe behind the gags. Kristof: I never got the harem vibe as much. Yes, the main character is in a club with all girls, but it never came off that way as only a couple of them were ever in play. 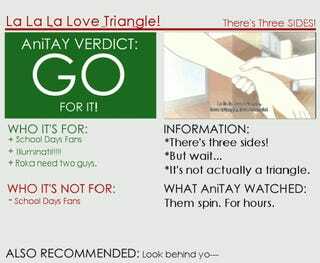 Though the show did have a couple of love triangles going on. Kristof: The 'minor characters' did add a lot to the show. I am suddenly reminded of the younger one's great sensitivity to Chi. His ability to sense when something was going on with Takao was superb. Kristof: Now that we are done with that I think I am going to stand by my 5, this is not a very 'deep' show, which is also one of the reasons I enjoyed it so much. FINAL SCORE: 6/10 - Average! Ascendant: Okay! So now we're gonna discuss the characters, which I'm gonna give an 8/10 for! Kristof: I'm giving it a 9/10 for the characters. As long as you don't mind a protagonist that is mostly a means of providing a punchline, good show by the way, and yells a lot, and I do mean a lot. Ascendant: Hell, a punchline machine for a main character is epic. The main reason I'm not giving it a ten is because the show under-uses and under-develops some characters. There were way too many to begin with. Kristof: The greatest offence in terms of an under-used character would have to be Noe. This show needed more Noe! Ascendant: One more annoying thing is the sort of useless Tsundere archetype used for Takao. I mean, if you're both useless and Tsun. Who's ever going to pick you?! Kristof: There is one particular character trait that somewhat trumps those glaring flaws. I agree that Kenji got enough punishment from the other girls, especially Chitose, to keep him covered, he did not need to get it from Takao as well. Ascendant: Gah. Well, in any case, the characters were quite varied, lots of different, albeit sort of typical personalities. I feel that they really could have had more development, though I do note that this is only 1-cour. Kristof: You just need to go into the show with the knowledge that all the characters are taken to the extremes of their archetypes. This is a show that is all about the number 11 and taking things there. Ascendant: Extreme personalities are perfect for a comedy, in any case. It would've been fine if they didn't have to make it semi-romance too. Jeez. Kristof: That's the basics about the characters, but I enjoyed them too much to give them anything lower than a 9. More Noe!!! Ascendant: Again, the lack of character development makes it stay at 8. FINAL SCORE: 8.5 - Almost Amazing! Kristof: The art and animation were solid and stayed consistent throughout the show, so I will give it a 7/10, more so for the consistence than anything else. It did match the show, so that gives it a boost too. I enjoyed the music, so I will give it an 8/10, there were a few minor problems. Ascendant: I'd give both a 7/10. Art wise, very plain, though it feels comfortable to watch, which is of course very important. 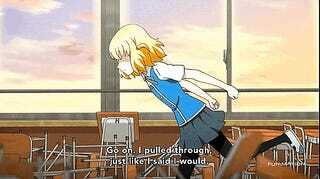 The animation wasn't anything special, quite simple as well, which is okay for a comedy anime. I personally found both the OP and ED to be lacklustre, and the BGM was rarely a treat to listen to. Again though, it does fit the anime. Kristof: I will agree with you on the OP, I am not a fan, but I will have to disagree about the ED. Not the type of music that I would normally enjoy, but there was just something about it that got stuck in my head. Ascendant: I do find it good music wise, but not really a song I would take with me. Kristof: The BGM did shine a couple of times, the 'boss' fight at the end springs to mind, but there were times where it did not mesh well with the scene it was used in. Ascendant: In any case, I watched the Subbed version, and of course, Kana Hanazawa was able to provide another EPIC performance! She was really able to make Roka sound almost terrifying, especially when they added some Vader style interference, whenever Roka's 'dark energy' was flowing out of her. Kristof: For a character that was projected as the personification of Moe, the score really turned her into the stuff of nightmares. If Moe does not fall in that category for you to begin with. Ascendant: Nah, never liked Moe stuff. I'm still gonna have to say though, Konishi Katsuyuki as Kenji never failed once to amaze my ears. His epic ability to belch bellow out those terrible timely one-liners is to be respected. Kristof: I don't believe that i have ever watched a show where the protagonist yelled more than he talked. But it would not have been the same without it. This show could go to some far off places, and Kenji would always bring it back around. FINAL SCORE: 7/10 for Art - Above Average!! 7.5/10 for Music - Almost Great! 7.25 for the Overall Direction - Above Above Average!!! Kristof: Mine is the aptly named Zipper Shot. For that second, Kenji enjoyed a glimpse of some very titillating melons, but soon, darkness took him. Completely worth it! Ascendant: In any case, I feel this show has a lot of great gags, too many to individually review. I give it a 9/10. Kristof: I give it a 9/10 too. I still find myself thinking back, at odd times, to my favorite ones and laughing, only to receive some awkward stares from my co-workers. Ascendant: Not gonna say too much here, might spoil some stuff for potential viewers! FINAL SCORE: 9/10 - Amazing!!! Kristof: Yes, yes and yes again. This show panders to the lowest common denominator in all of us, but that is why it is so fun to watch. Ascendant: Yeah! This show definitely manages to bag many important aspects of comedy anime, which makes it really great! Kristof: Bag? Did you just say bag?! Roka: You better watch this show. Or you'll be next.